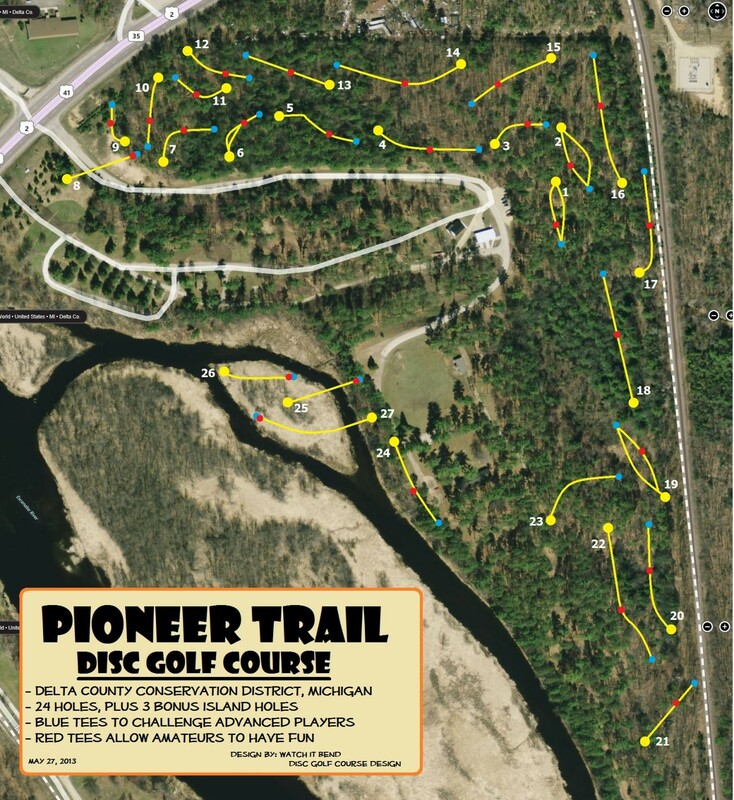 One of the newer additions to the outdoor sports scene, disc golf, is soaring in the Upper Peninsula. You’ll find courses from Sault Ste. Marie to Silver City. But here in the Bays de Noc area, we’re rattling dem chains to be the premier destination for beginners to seasoned pro disc tossers. We talked with Rick Elrod, co-owner of MISH Watersports and secretary of the Noc Bay Flyers Disc Golf Club to share with you his take on the sport. Q: Disc golf is relatively new. How is it played? Rick: It is similar to regular golf. 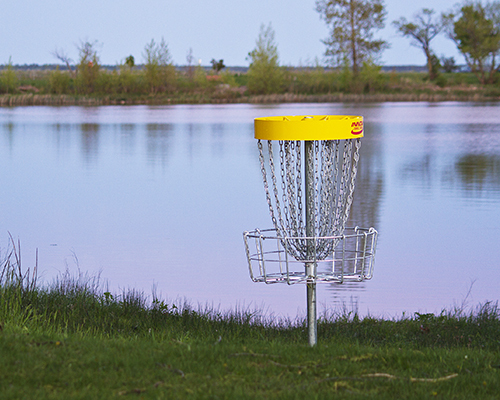 Instead of hitting a ball into a hole, you rip a Frisbee®-like disc down a fairway toward a pole draped with a chain basket. The object is to complete the course by tossing your disc into each basket with the fewest number of throws. Each hole has at least one tee area and its share of challenges from disc-ricocheting, tree-lined fairways to steep hills and water hazards. There’s no cruising around in a cart – this is a walk-the-course workout. Q. Who should try it? Accessible. Most courses are free and open to the public. Inexpensive. You can get used discs for as little as $10. A new disc will only cost you $15 to $25. The only additional equipment you might want is a disc carrying bag and a towel to dry your hands. Casual, but competitive. You dress for the weather. Practice getting better. And play to win. Good outdoor exercise. I love getting out, walking in the woods and playing along the Bay. Our winters are mild in Delta County, not as much snow as some parts of the U.P., so you can usually play year-round. Start out with one disc. Most disc golfers will have at least three discs in their bag: a driver, mid-range and putter. When you’re starting out, get just one disc. Choose one that’s lighter weight; heavier discs require more skill to control. Discs are rated overstable, stable and understable. You’ll want to start with understable (rated less than 0). It will give you a further throw before curving. As you wind up to throw, plant your feet and hold the disc at shoulder height rather than waist height. Keep your arm in a straight line as you pull it across your chest. Wear good fitting footwear. You’ll do a lot of walking and you don’t want to slip. Bring a towel. You’ll want to keep your hand dry for better control of each throw. Have fun! You’ll chase more off-course discs at the beginning, but you’ll get a feel for your disc with practice. Enjoy being outdoors! Ludington Park: Hole #6. You throw over the water to the park’s man-made island. North Bluff Disc Golf Course: Four of the holes are on the ski hill. One, #25, you throw down the hill. The view of the Bay is great. 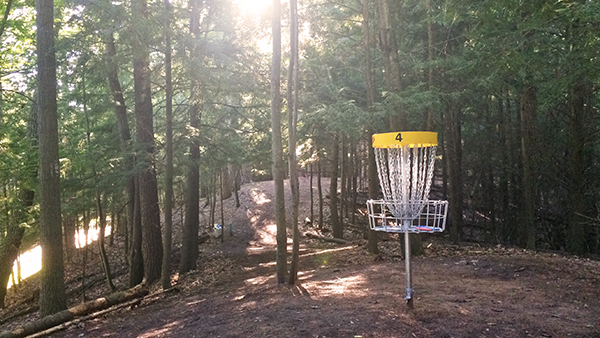 Pioneer Trail Park: Hole #13. You can see the basket straight ahead but it’s actually a tight turn shot and it’s tough not to hit a tree.